The Lunney book is now sold out! There are still a few Doherty and Gibson books. The O’Neill book is expected to be published in the spring of 2019. I have been contacted by three people from Ireland and one person from the USA who are connected by DNA to Al. If anyone reads this and if anyone wants to collaborate on Ryan/Gleeson genealogy, please contact me at jeri.lunney@gmail.com. My research on the O’Neills is going strong. I have found new family tree branches and descendants who are connected by DNA to Al. We found Johanna Mantle’s baptism and our hypothesis was correct! Well, I thought that I was through with my genealogy research but I missed doing it so here I go again. I am researching the family of John O’Neill and Ellen Dwyer. 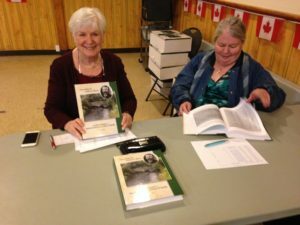 We travelled to Hastings on September 30, 2017 to distribute the book to our cousins. The Gibson book has been mailed or delivered to almost everyone who signed up. I am really pleased with it! Al and I travelled to Ireland in October and walked the lands from which the Gibsons came. The Gibson genealogy book will be sent to the printer probably by the end of this week. It is a hard cover book, 426 pages in length. It will be on sale for $50 plus shipping if applicable. I will be delivering books to Hastings, Ontario, on Saturday, September 30, 2017. If interested please contact me. Books must be pre-ordered. This is the message I am trying to get to folks. 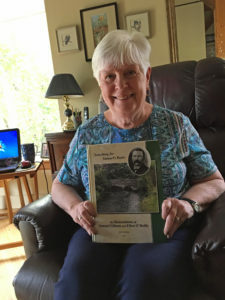 The book I have been working on, (with wonderful help from fellow researchers and our incredible editor), for the descendants of Samuel Gibson and Ellen O’Reilly is 95% complete. Because of the emphasis on DNA, I am waiting until late summer to publish it. It has been a labour of love, filled with surprises. I require pre-orders since I am self-publishing this book. It will be a hard cover book, about 415 pages in length with several colour pages. The price will be probably $50 (plus shipping if applicable) as it was for the Lunney book and the Doherty book. I wish to send requests to members of the family and require contact information. Can you help me by providing email addresses for as many as possible? I will send a separate email to each person with a copy of the Table of Contents and details about price, shipping, etc. Thank you in advance for helping me get pre-orders. Each of you has in some way contributed to this book so my thanks is two-fold. The number of books will be limited and I don’t anticipate a second printing. Our plan is to travel to Hastings, Ontario, in the fall to distribute as many copies of the book as possible. I am also looking for a location from which to set up a table to sell the books so if any of the “locals” have an idea, I would appreciate it. We are well underway with a book on the Descendants of Samuel Gibson and Ellen O’Reilly. Please contact me if you have anything to contribute or if you wish to purchase a copy. Publication is expected for the summer of 2017. PS If anyone knows why Ellen has been called Ellen Elizabeth, I would love to know the source.